I love this quote. I love this quote because it stands out for those who are healing from their past. I love this quote because it’s strong and stands true! This isn’t only made to be said for woman, but men also! I think about my own healing when I read this quote. It’s the same thing as “opening up a wound, and healing it closed with truth”. Each wound opened and healed, is another wound they no longer have control over. People who suffer from trauma can take the bricks that were thrown at them, and build a stronger foundation with those bricks to move forward in your own path. Each one of those bricks is the way to your healing; to wholeness in finding your true self. I got an email from someone yesterday and it has stuck with me all day today. It’s amazing how many people out there who suffer trauma from their past. It’s amazing how many people out there who are brave enough to take those bricks that were thrown at them, and build a stronger foundation; a foundation where you are saying “I am in control this time”. The person who emailed me, just took a brick and said “no more will I suffer alone”. I guess you could take a few of those bricks and throw them back, but that is one less brick for you to have in your own path. I have never believed in an “eye for an eye”. I think there is more power in healing, than giving it back to those who hurt you. My healing is winning over their lies. each wound I open and close with truth, is one less piece of power they have over me. I do alot of my path making in therapy, and I have an absolutely wonderful helper – someone I trust that has truly helped me build this path I have been on for years now. I am truly blessed beyond words! Then there is my support system on the outside, people who have been by my side with open arms the whole time; helping me with each brick with understanding and care. I couldn’t ask for anything more! I not only am building a path, but building a support system with those bricks as well; a support system of people who understand what it means to heal, and people who see the parts where you are kicked down and need help getting back up. Then you have God, who stands over all of us, guiding us in the direction to build that path with hope and love, trust and connection. It’s hard work, but good work. Some-days I feel like taking those bricks and CHUCKING them back with anger, and sometimes I actually do – but I always pick it back up and start working again. There are times I sit in sadness, and have a hard time working towards it. There are times I want to give up, and just crawl into bed and have hope that someone is still building that path for me, even though I am not there doing the work. However, I still keep going with the wonderful support by my side who holds my hand at times in helping me gain the strength to keep going forward – wound by wound, brick by brick. It’s hard, it’s right, and it’s healing. Previous postthe sunspots . .
Karen, this one is awesome! I love this one! how true is that??? 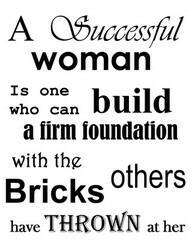 you give everyone the hope to build a foundation with their own bricks!